Today is the birthday of Joseph Bosch (February 11, 1850-January 9, 1937). 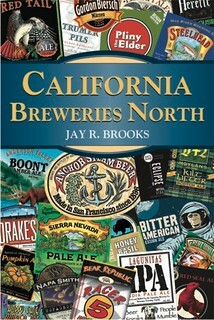 He was born in Achim, Lower Saxony, Germany, the son of a brewer, but came to America in 1854. 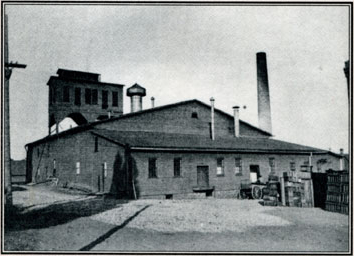 They started in New York, but moved to Lake Linden, Michigan in 1862, and a few years later began training as a brewer. 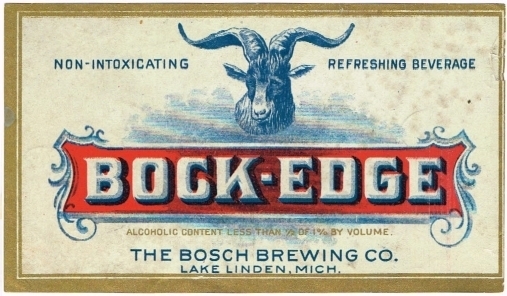 In 1874, he came back to Michigan, and started his own brewery, the Torch Lake Brewery, which eventually became known as the Bosch Brewing Co. 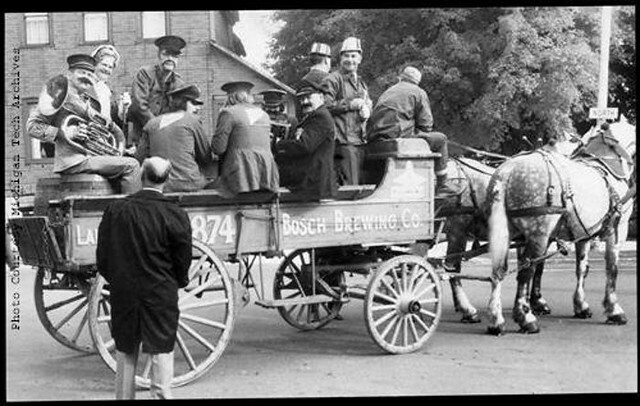 It survived prohibition, but Bosch died in 1937. His two grandsons took over management of the company, and it stayed in business until 1973, when their labels were soon to the Jacob Leinenkugel Brewing Company. Joseph Bosch was born in Baden, Germany in 1850. 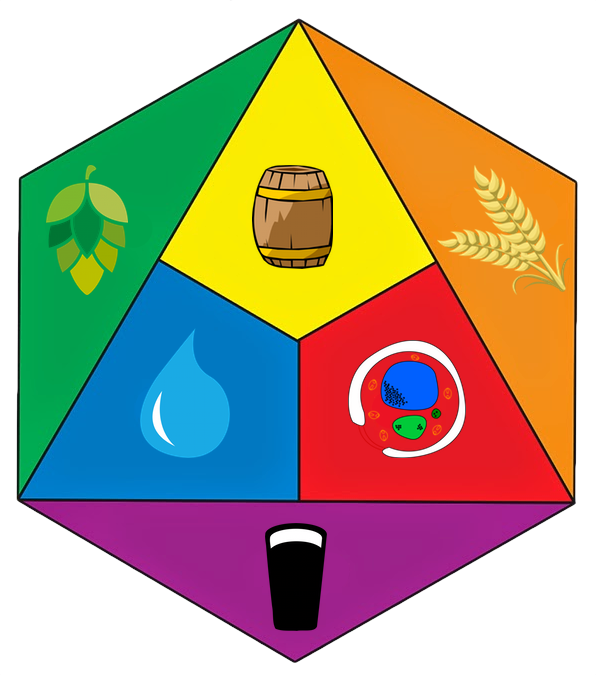 He emigrated to New York with his family when he was four, then moved to Wisconsin at the age of twelve, where his father was a brewer. 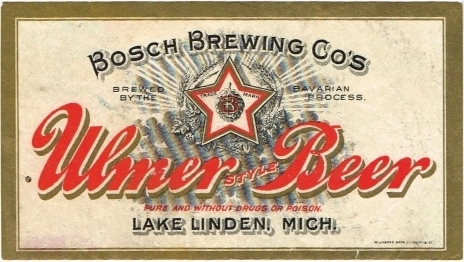 In 1867, the family moved to Lake Linden; there, Bosch worked as a miner of the Calumet & Hecla company. 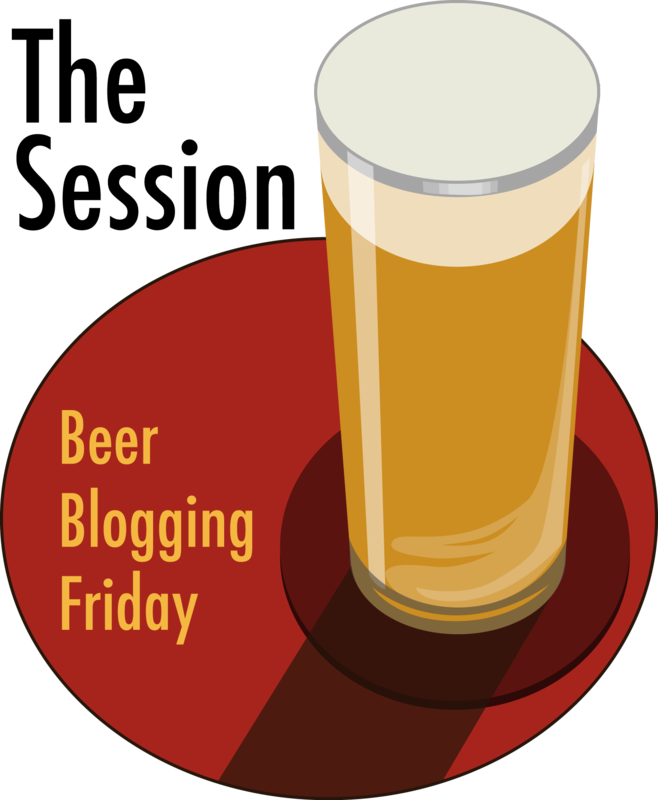 However, he harbored the desire to become a brewmaster, and travelled to Milwaukee, Wisconsin to work at the Schlitz Brewery, then on to Cleveland, Ohio and Louisville, Kentucky before returning to Lake Linden in 1874 to found the Torch Lake Brewery. 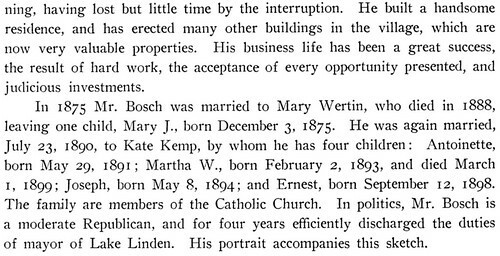 Two years later he admitted business partners and changed the name to Joseph Bosch & Company. 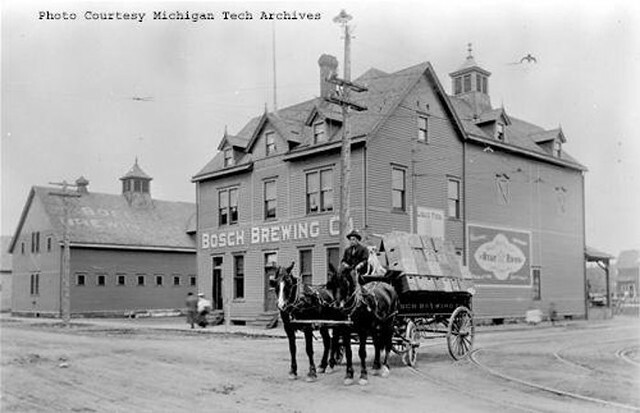 In 1894 he again changed the name, this time to Bosch Brewing Company, and in 1899 the brewery was the largest in the Upper Peninsula, with a capacity of 60,000 barrels annually. 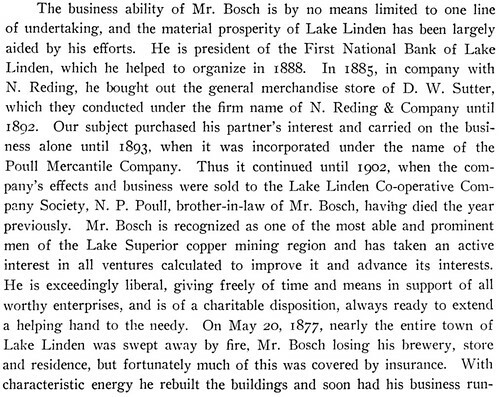 Bosch was also the president of Lake Linden’s First National Bank, organized in 1888, and participated in various mercantile enterprises, including those carried on in the Joseph Bosch Building. 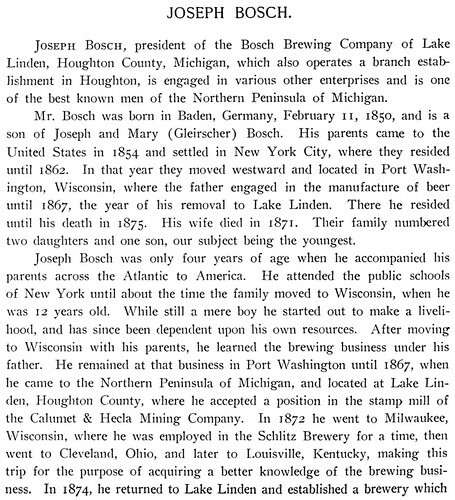 JOSEPH BOSCH & CO., proprietors of Torch Lake Brewery. 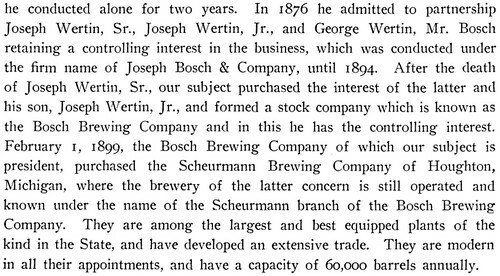 This business was organized in 1874, and is owned one-half by Joseph Bosch, the other by Joseph Wertin & Sons, of Hancock; 4,000 barrels of beer. are manufactured annually, 1,000 of which is bottled. 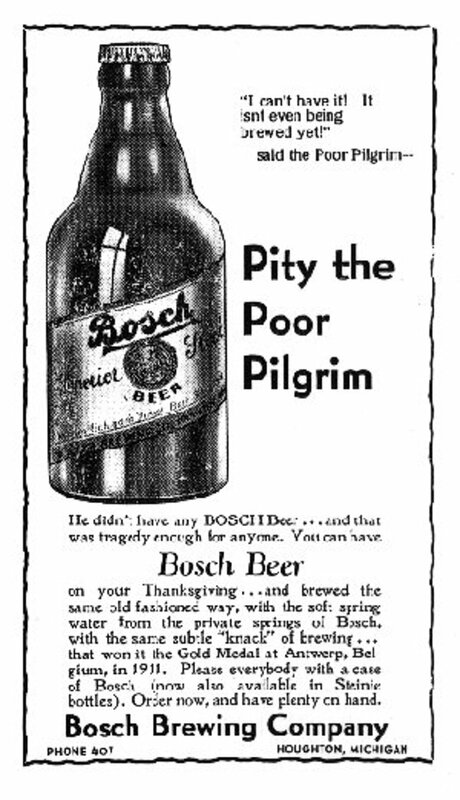 Joseph Bosch was born in Baden, Germany, February 13, 1850, and came to America with his parents in 1854; he spent nine years in New York City, and then removed to Port Washington, Wis., where he learned the brewing business with his father. 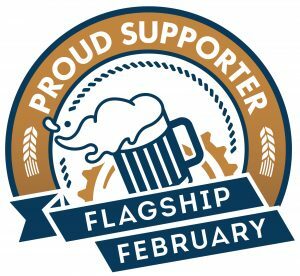 In 1867, in company with his father, he came to Torch Lake, and erected the first house in what is Lake Linden; he worked four years at the Hecla Stamp Mill. 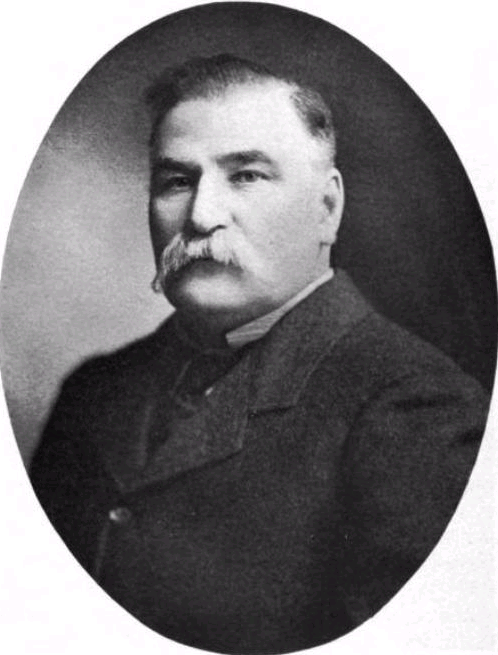 In 1874, he built the brewery; he was married at Hancock in January, 1875, to Miss Mary, daughter of Joseph Wertin. Mrs. Bosch was born in Austria. They have a daughter — Mary.